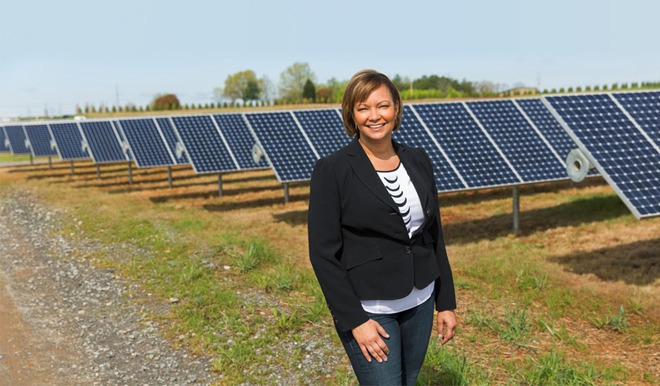 Apple's Senior Vice President for Vice President Environment, Policy and Social Initiatives Lisa Jackson granted an interview to an Australian publication, and continued to drive home Apple's goal towards using 100 percent recycled materials across all of its products, Apple's "right to repair" philosophy, and Apple's point of view on the taxes it pays. "What we've committed to is 100 percent recycled material to make our products, or renewable material. We're working like gangbusters on that." Jackson told News.Com.Au on Monday. "As far as I know, we're the only company in the sector trying to figure that out. Most people talk about recycling electronics but the material is not necessarily used in new electronics." Monday's interview is the second time that Jackson has discussed Apple's drive for 100 percent recycled material use. In April, Apple pledged to use 100 percent recycled materials in a closed supply loop for future fabrication of its devices — but how it intends to do so still isn't clear. Jackson didn't delve into any specifics of Apple's research on the matter in the interview. Jackson was asked about criticism that Apple had taken regarding it's apparent unwillingness to make it easier for customers to repair iPhones, iPads, and Macs. "Let's be really clear, there is nothing about Apple's thinking on our devices that isn't for having a long lasting device that's great for the planet, that can then be recycled, and hopefully be reused to make more devices," answered Jackson. "That's our goal ultimately." "We run our own repair programs and then authorize and certify repairers. The question is in a device that is increasingly complex, what is best for the customer? Third-party, unauthorized repairs are exactly what they sound like," said Jackson. "We want to make sure repairs are done correctly." The interview addressed Jackson's credentials prior to her job at Apple. Jackson spent 25 years at the U.S. Environmental Protection Agency (EPA), with four years as the Administrator of the agency. Referring to the Trump administration's choices in regards to the current head of the EPA, and the roll-back of regulations previously in place, Jackson said that American leadership "remains important and will be missed." However, Jackson also pointed out that despite Apple not being required to reduce its carbon footprint, it is doing so anyway. "We have had since 2012, the first data center that relies purely on renewable energy," Jackson said. "If we can do it, you should expect the same from every company." Jackson was asked about Apple's involvement in the "Paradise Papers." A leak of financial documents accused Apple of moving a holding firm to the Channel Islands, potentially contravening tax laws —should the leak be entirely accurate. "We're the largest corporate taxpayer in the world," Jackson said. "And we follow the laws where they are, we've been really clear on all of those things." Apple's tax affairs are the latest in a number of financial scandals to have erupted after the Paradise Papers were leaked to a German newspaper and shared to other media outlets in the International Consortium of Investigative Journalists. Other discoveries in the leak include reports that part of the British Queen's private estate is invested offshore, and that an official from President Donald Trump's administration held a stake in a firm connected to Russian President Vladimir Putin's son-in-law.